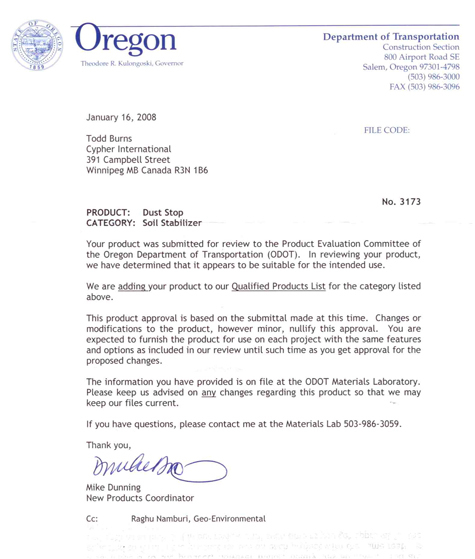 The attached approval from the Oregon Department of Transportation for Dust Stop by Cypher Environmental has just been fully approved in record time by one of the strictest Product Evaluation Committees in the U.S.A. Our product, Dust Stop has been added to the Qualified Products List in the category for Soil Stabilization. This D.O.T. approval is the baseline test for transportation certification departments worldwide, especially in North America where restrictions and proven results are more critical than almost anywhere in the world. It was also verified in full by the Geo-Environmental Dept. and the demand for a benchmark tested product such as Dust Stop worldwide is now critical due not only to industrial but health issues as well. This simply confirms that Dust Stop®, whether for dust control or soil stabilization, is another Cypher environmental product in high demand that is fully certified and is in immense demand worldwide.